The total size of uncompressed data that is processed on the cell. For scan on hybrid-columnar-compressed tables, this statistic is the size of data after decompression. The number of I/O bytes sent back to the database server for processing due to CPU usage on Exadata Cell. The number of I/O bytes saved by the database host by offloading the file creation operation to cells. This statistic shows the Exadata Cell benefit due to optimized file creation operations. The number of I/O bytes saved by the database host by offloading the RMAN file restore operation to cells. This statistic shows the Exadata Cell benefit due to optimized RMAN file restore operations. 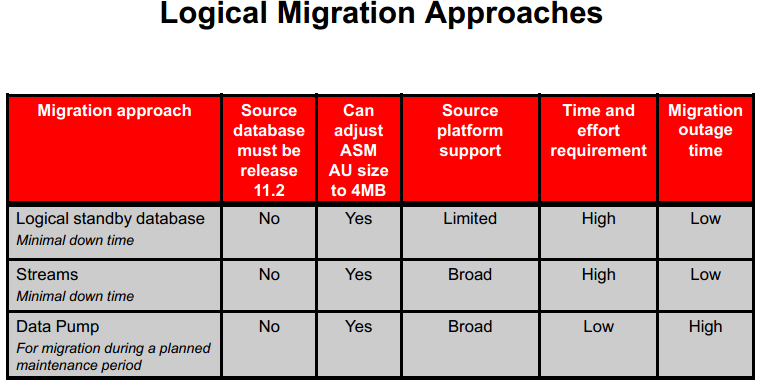 ASM Online Migration: This method is only applicable if your database is already using ASM and you do not need to adjust the ASM allocation unit (AU) size. existing disks from your ASM disk groups to migrate the data.